The CERN (European organization for nuclear research) council has supported Russia’s bid to obtain associate membership in its ranks. ITAR-TASS reported this, quoting the director of the international department at the Russian Ministry of Education and Science, Yevgeny Ugrinovich. “The expert report on the status of high-energy research in Russia was discussed, and it was accepted. The CERN council supported Russia’s bid to obtain associate member status by consensus,” said Ugrinovich. 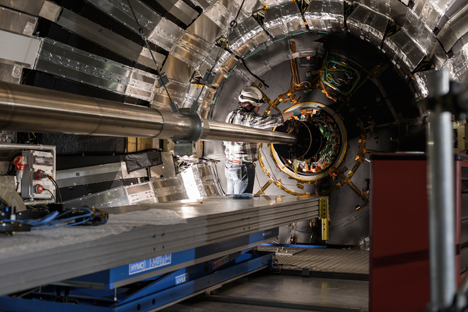 The international group of experts from the CERN member-states that prepared the abovementioned report came to Russia this summer and visited a series of scientific centers. They attended meetings with the government of the Russian Federation, as well as with leading scientists. Russia submitted the bid for associate membership in the organization in December 2012. As Dmitry Livanov, former Minister for Education and Science of the Russian Federation, announced, this will allow Russian manufacturers of high-technology products and materials to receive preferences when participating in any tenders issued by CERN. “And that’s big money—hundreds of millions of euros annually,” said Livanov. Amongst other advantages of associate membership in the world’s largest high-energy physics research laboratory, Livanov emphasized Russian involvement in making the most important decisions—both financial and scientific. “Young Russian scientists, students and post-graduate students can become more actively engaged in educational programs at CERN and in international cooperation. This will enable them to raise their standards as future scientists,” the former minister said. Associate membership in CERN will cost Russia approximately 7,800,000 Swiss francs ($8.5 million). This amounts to not less than 10 percent of the sum that the country would have to pay annually if it were a full member of the organization. For example, Germany contributes 20-25 percent of its annual budget to CERN, which amounted to 1,200,000,000 Swiss francs in 2012. Israel, Cyprus, Romania, Serbia and Ukraine are in the process of obtaining full member status in the organization, while Turkey and Brazil are in the process of obtaining associate membership.